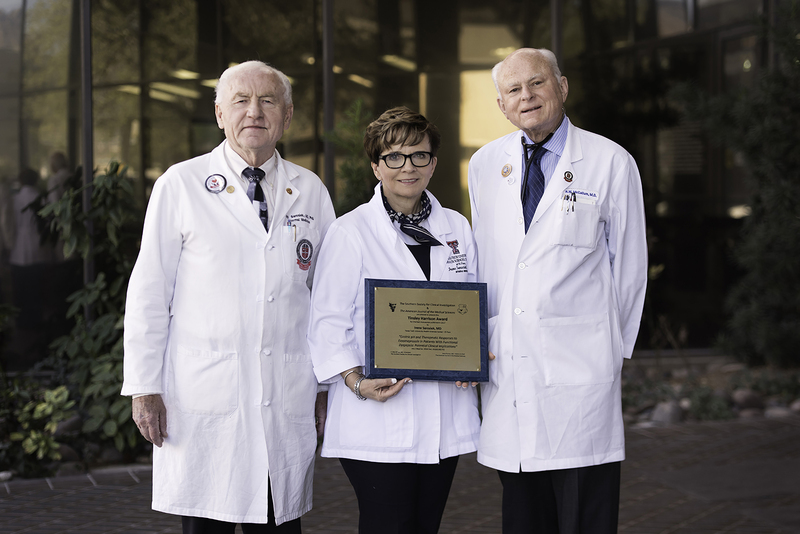 Three Texas Tech University Health Sciences Center El Paso (TTUHSC El Paso) faculty members were honored recently with the 2018 Tinsley Harrison Award for the best original manuscript published in The American Journal of the Medical Sciences (AJMS, December 2016). Three Texas Tech University Health Sciences Center El Paso faculty members were honored recently with the 2018 Tinsley Harrison Award for the best original manuscript published in The American Journal of the Medical Sciences. 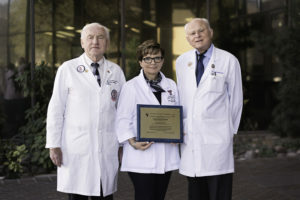 The report was the culmination of years of teamwork in completing a study designed by Dr. Sarosiek’s husband, Jerzy Sarosiek, M.D., Ph.D., associate chairman for research in the Department of Internal Medicine. In addition to the Sarosieks, TTUHSC El Paso Professor Richard McCallum, M.D., was a contributing author of the article. The study looked at treatments for patients with functional dyspepsia, or patients who are feeling stomach pain with no obvious cause, like an ulcer or erosion in the stomach. They would also make sure the patients did not have a gastric infection with Helicobacter pylori, one of the leading causes of ulcer-like symptoms. The investigators examined the role of patients’ own gastric acid secretion in the development of functional dyspepsia symptoms not related to Helicobacter pylori. In order to diminish gastric acid secretion and relieve symptoms of dyspepsia, the patients were treated with either the active drug esomeprazole or a placebo in a randomized, double blind, placebo-controlled clinical trial. An important part of the design of the study was that, after treatment, subjects were tested on things that could be objectively measured, like stomach acid levels. One of the surprising results was that in some subjects taking a placebo, not only was less pain reported, but their stomach acid levels went down, too. “So if a patient believes he or she is getting the drug, somehow the mind is having a measurable impact on gastric acid secretion,” Dr. Jerzy Sarosiek said. Among the patients who received a dose of esomeprazole, relief of symptoms was reported in more than 70 percent, compared to 30 percent in the placebo group. In yet another unique aspect of the study, the patients who didn’t report relief were then given a second dose. The award was created in memory of Tinsley Harrison, M.D., one of the founders of the Southern Society for Clinical Investigation. Drs. Irene and Jerzy Sarosiek and Dr. McCallum accepted the award at the society’s annual meeting in February in New Orleans. Dr. Irene Sarosiek said she hopes the award inspires the faculty, staff and students at TTUHSC El Paso and shows them what is possible when all the minds at the university work together. For more information about Drs. Jerzy and Irene Sarosiek, and Dr. Richard McCallum, visit the department’s webpage.